Oh, zombies. 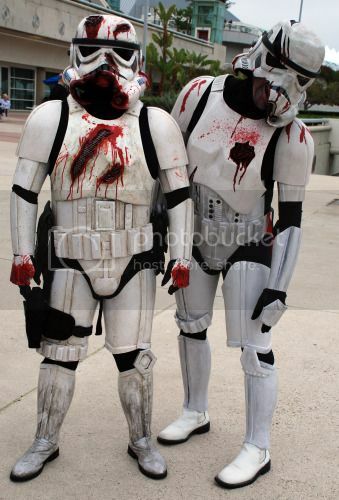 Leave it to the undead to rejuvenate what George Lucas has tried to hard to asphyxiate. In October, an entire novel about undead Imperial troopers, Star Wars: Death Troopers, will become available through book-distribution-system-things. Then, a planned update to the Star Wars Galaxies online game will likely follow, which will allow players to participate in “events related to the [Death Troopers] book.” Which, I can only assume, will include gaining Force Points by eating Luke Skywalker’s brain. Finally–and I’m just prognosticating, here–on the second season of the Clone Wars cartoon, Jedi Padawan Ahsoka becomes infected by the zombie virus and devours Jabba’s flamboyantly gay uncle before completely rotting away. I mean, that’d be the logical course of events, anyway. Or desirable. Whichever. Aren’t most Troopers clones anyway?